These spicy, soft ginger cookies are delicious. But that's not all - Offering homemade cookies, cakes and more below. Cream margarine and 1 cup white sugar until light and fluffy. Stir in the molasses. Mix the water and baking soda together and stir. Sift the flour, salt and dry spices together and gradually add to the fluffy margarine and sugar mixture. Mix well. Stir in the fresh ginger. Shape into walnut-sized balls and roll them in the remaining 2 tablespoons of sugar. If the dough is too soft to handle, add a bit of flour or chill for 20 minutes (or even overnight). Place the balls two inches apart on an ungreased cookie sheet, and slightly flatten. Bake for 10 to 12 minutes. These homemade ginger cookies are best made a day ahead. In a mixing bowl, cream butter and brown sugar until light and fluffy. Add the eggs, one at a time, and beat well after each addition. Combine the flour, pudding mixes, ginger, baking powder and cinnamon; gradually add to creamed mixture and mix well. Cover and refrigerate for 1 hour or until easy to handle. Lightly flour counter and roll out dough to 1/4 inch thick. 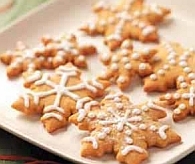 Cut out with a lightly floured cookie cutter. Place on ungreased cookie sheets one inch apart. Bake for 6 to 8 minutes until firm. Makes 2 dozen. While I have ginger on my mind, instead of soft ginger cookies, here's a wonderful recipe for homemade gingersnap cookies. In a large bowl whisk together the flour, baking soda, baking powder, ginger and cayenne. In a separate bowl cream the butter and sugars until mixed together. Add the eggs, molasses and vanilla and beat until well combined. Slowly add the dry mix into the wet ingredients until a uniform dough forms. Taking a small bit of dough, roll around in your hands to form into ping pong sized balls. With a plate of white sugar, press the balls lightly to coat one side.